Productivity roadblock comes in more forms than what we are commonly aware of. 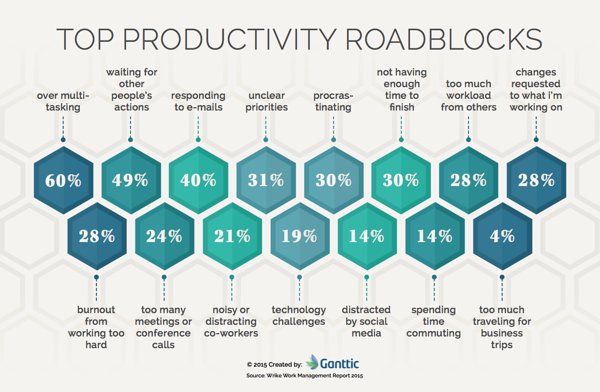 This infographic shows you the 15 most common productivity roadblocks and this post will provide you solutions to reduce these statistics along the way. Juggling too many tasks at the same time is terrible for productivity, a whopping 60% of employees are essentially getting none of these tasks done. 49% of employees that wait for other people’s actions end up being less productive. Responding to e-mails take up so much time that 40% of employees are affected by it. 31% have unclear priorities while 30% find procrastination causes low productivity. 30% of employees suffer from stunted productivity because they don’t have enough time to finish their work. Moving down the list, 28% of productivity roadblocks come from too many new requests from managers and others. A second 28% comes from frequent changes to current work and another 28% is due to burnout from working too hard. 24% of productivity downfall is from too many meetings or conference calls. 21% from noisy or distracting co-workers. 19% of productivity shortcomings is from technology challenges. With 14% of productivity problems being from distracted by social media. 14% is from spending time commuting. 4% is from too much traveling for business trips. There are a few quick behavioral solutions to remove some of these productivity barriers. Most of these simple solutions are just higher work ethics standard, others require the self-inspection of supervisors and managers. For example, allow employees to focus on one thing at a time and you will see the spike in them actually finishing their work. And while checking Facebook once in a while seems to be a good method of taking a break, research has shown that it is taking far longer than appropriate. Technology challenges can be solved by first understanding how tech-savvy each employee is, then using this information, a company is able to decide whether to provide workshops for the less tech-savvy or arrange tech-mentors. But more often than not, these productivity barriers are a reflection of a greater issue that has to be addressed on every scale. While it may seem that these employees are not motivated enough to find out their priorities and stop procrastinating, the problem comes from deeper within - motivation. Managers can solve this at a snap of the fingers by introducing a streamlining system to help employees determine their priorities and provide them with a go-to planner to keep track of their work productivity. Using such a tool would also decrease the number of people waiting for other people’s actions to complete their job. If a task isn’t done, everyone can clearly see it and work on other things to maximise productivity. Having too much workload from others, suffering burnout from working too hard, having too many meetings or conference calls are all the result of poor capacity management. Ganttic has the feature of calculating utilization percentages to keep tasks equally divided among resources. Once everyone in the team is clear on everyone’s responsibilities and priorities, these unnecessarily high statistics will noticeably decrease. If you’re looking to increase productivity in your workplace, sign up with Ganttic for a free 14-day full features trial to give resource planning a try.